4. 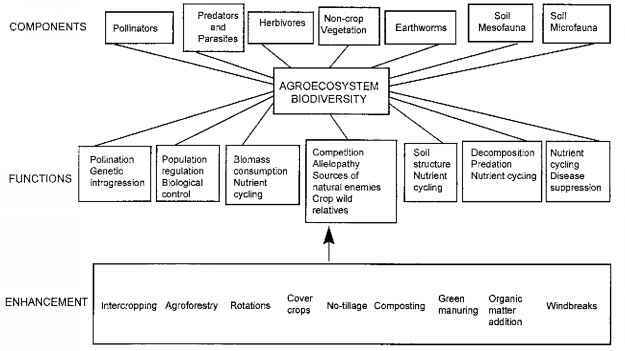 The extent of the isolation of the agroecosystem from natural vegetation. higher biodiversity than do highly simplified, input-driven, and disturbed systems (i.e., modern row crops and vegetable monocultures and fruit orchards) (Altieri, 1995). All agroecosystems are dynamic and subject to different levels of management so that the crop arrangements in time and space are continually changing in the face of biological, cultural, socioeconomic, and environmental factors. Such landscape variations determine the degree of spatial and temporal heterogeneity characteristic of agricultural regions, which in turn conditions the type of biodiversity present, in ways that may or may not benefit the pest protection of particular agroecosystems. Thus, one of the main challenges facing agroecologists today is identifying the types of biodiversity assemblages (either at the field or landscape level) that will yield desirable agricultural results (i.e., pest regulation). This challenge can only be met by further analyzing the relationship between vegetation diversification and the population dynamics of herbivore and natural enemy species, in light of the unique environment and entomofauna of each and the diversity and complexity of local agricultural systems. According to Vandermeer and Perfecto (1995), two distinct components of biodiversity can be recognized in agroecosystems. The first component, planned biodiversity, is the biodiversity associated with the crops and livestock purposely included in the agroecosystem by the farmer, and which will vary depending on management inputs and crop spatial/temporal arrangements. The second component, associated biodiversity, includes all soil flora and fauna, herbivores, carnivores, decomposers, etc. that colonize the agroecosystem from surrounding environments and that will thrive in the agroecosystem depending on its management and structure. 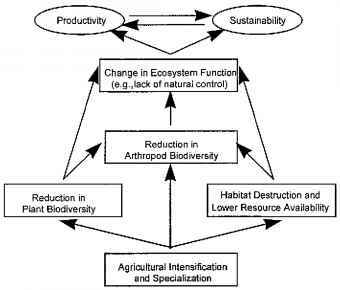 The relationship of both biodiversity components is illustrated in Figure 3. 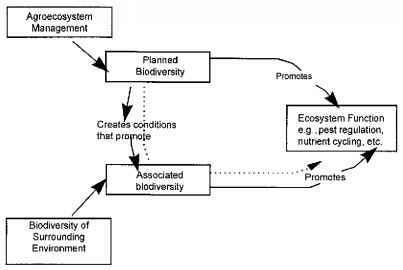 Planned biodiversity has a direct function, as illustrated by the bold arrow connecting the planned biodiversity box with the ecosystem function box. Associated biodiversity also has a function, but it is mediated through planned biodiversity. Thus, planned biodiversity also has an indirect function, illustrated by the dotted arrow in the figure, which is realized through its influence on the associated biodiversity. For example, the trees in an agroforestry system create shade, which makes it possible to grow only sun-tolerant crops. So the direct function of this second species (the trees) is to create shade. Yet along with the trees might come small wasps that seek out the nectar in the tree flowers. These wasps may in turn be the natural parasitoids of pests that normally attack the crops. The wasps are part of the associated biodiversity. The trees, then, create shade (direct function) and attract wasps (indirect function) (Vandermeer and Perfecto, 1995). The key is to identify the type of biodiversity that is desirable to maintain and/or enhance in order to carry out ecological services, and then to determine the best practices that will encourage the desired biodiversity components. As shown in Figure 4, there are many agricultural practices that have the potential to enhance functional biodiversity, and others that negatively affect it. The idea is to apply the best management practices in order to enhance and/or regenerate the kind of biodiversity that can subsidize the sustainability of agroecosystems by providing ecological services such as biological pest control, nutrient cycling, water and soil conservation, etc.